Fig. 22-5. Attitude Control System Module Within the MMS Spacecraft onboard processor and the ground software [Werking, 1976], Definitive attitude will be determined by the onboard processor. For SMM, the onboard computer will spend approximately 30% of its time in attitude-related activities. Ground processing will be used for early mission support (stabilization and attitude acquisition), for calibration or bias determination (to determine sensor parameters which will then be telemetered for use in the onboard processor), and for operational control support (system monitoring, TDRSS scheduling, ephemeris and target star uplink, and maneuver planning). The SMM example is representative of the types of functions that can best be carried out by splitting data processing between the onboard computer and the more sophisticated ground-based systems, and again indicates the need for sensor systems that can be analytically modeled so that bias determination and state estimation is possible. The MMS attitude control module is intended to support Earth-observation, solar physics, and astronomy payloads'in both near-Earth and geosynchronous orbits. At present, it is not clear how widespread use of the MMS spacecraft design will become. * As with other attempts at standardization, the main problem is obtaining sufficient flexibility at low cost. A second standard spacecraft configuration will be used for the Applications Explorer Missions, AEM, the first of which will be the Heat Capacity Mapping Mission, HCMM [Smith, 1974].1 The AEM series will be relatively low-cost missions using a small spacecraft (up to 165 kg at launch) orbited initially by the Scout launch vehicle and by the Space Shuttle for later missions. The missions will generally be Earth oriented, with attitude control to approximately I deg in pitch and roll and 2 deg in yaw. The main components of the attitude control system are two reaction wheels incorporating horizon scanners similar to those used for Nimbus and LANDSAT, which provide both attitude determination and control. (HCMM will use only a single scanner.) A triad of magnetic torquers will be used for initial acquisition, roll control, and momentum control. Digital Sun sensors and a triaxial fluxgate magnetometer will be used for yaw angle determination. A third reaction wheel along the roll axis may be included on some missions. An alternative approach to hardware standardization is to design it with the specific goal of extreme flexibility. For example, an attitude determination package might consist of a coarse element and a fine element, both of which provide redundancy and nearly full sky coverage. The fine element could consist of either a specific payload sensor or a combination of redundant gyroscopes (Section 6.5) and fixed head star trackers (Section 6.4), capable of accurate attitude determination in any orientation. The fine element would be used only for attitude refinement based on a good a priori estimate and would be included only on missions for which pointing accuracies of less than about 0.5 deg are required. •As ot.January 1978, MMS spacecraft were intended for use in seven missions (SMM. STORMSAT, CLIMSAT, LANDSAT-D, LFO-E, GRO. and PSCTS) and possibly for further missions in these series. See Appendix I for acronyms and additional mission details. •As of January 1978. spacecraft in the AEM series were HCMM, SAGE, COBE, ERBS, EUVE. and STEREOSAT and possible follow-ons. See Appendix I for acronyms and additional mission details. larger. 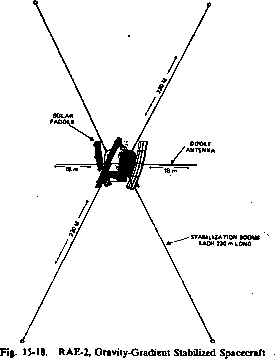 An appropriate coarse attitude package flown on COS-B and ISEE-B consists of two pairs of slit sensors capable of triggering on both the Sun and the Earth and distinguishing between them (see Section 6.2 and Massart .) A single package consisting entirely of three slit sensors has also been proposed [Wertz, 1975]. Table 22-2 compares the redundancy and coverage of the celestial sphere for the package of three slit sensors and the package of five horizon sensors and two Sun sensors flown on the SMS/GOES missions. From the table we see that the three-sensor package provides nearly full sky coverage for both the Sun and the Earth and the potential for attitude determination even with the loss of any two of the three sensors. The seven-sensor package provides substantially less sky coverage and redundancy.